It is quite usual to have premature babies but many of them don’t survive as their resistance is poor.This child from Mumbai has been is being called as miracle baby as he fought for his life for 132 days in Neonatal Intensive Care Unit (NICU) at a city hospital and came out as a winner. Nirvaan, India’s smallest and youngest pre-term baby who was born after 22 weeks only, has a normal brain, vision, hearing and potential for long-term neurological development. According to doctors, Nirvaan was treated by a team of 14 doctors and 50 nursing staff. The baby, who was born on May 12, 2017 during the 22nd week of pregnancy, had a birth weight of 610 gms, with 22 cm head size and a length of 32 cm. 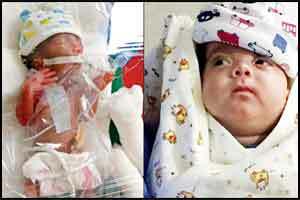 “Nirvaan had immature lungs at birth requiring ventilatory support right from the labour room. He required respiratory support for 12 weeks which included six weeks of ventilator support. Multiple doses of surfactant injections were instilled into the breathing tube to expand his lungs,” said Bhupendra Avasthi, Director of Surya Child Care, Surya Hospital. Explaining the complications, Avasthi said the patient survived life threatening events such as pneumothorax (air accumulation around the lungs) and brain bleeds to emerge as a victor. “A month-long steroid treatment was needed to help him breathe on his own. The steroid treatment also increased his risk of having infection and high blood sugars which required antibiotic and insulin therapy. Multiple blood transfusions, LASER treatment of eyes and hernia surgery were also required during this period. Oral feeds could be given only after three months of age,” said Avasthi. Medical science says that infants born between 22 and 24 weeks of pregnancy are considered periviable infants or infants born at the limits of viability, as a foetus may not exist independent of the mother prior to 22 weeks. Medically, when it comes to 22-week gestation premature infants, 40-50 percent of them are born dead (still born) worldwide. Among those born alive, less than five percent continue to survive. The surviving infants are at high risk of having serious neuro developmental disability such as cerebral palsy, mental retardation, hearing loss, visual impairment and epilepsy. Stating that there was no report of a surviving 22-week newborn before Nirvaan in India, the doctors said that there was also limited experience with other hospitals in managing such babies. Doctors said that after six weeks, Nirvaan was taken off the ventilatory support and weighed 1kg while on complete milk feeds. He was, however, continued on non-invasive respiratory support for the next six weeks. “Multidisciplinary management in the form of heart and brain scans, bone integrity checks, hearing assessments, skin care, physiotherapy, lactation support was required. The family was also provided emotional support through rigorous counselling by the medical team,” said Avasthi. Earlier, the Surya Hospital had also received a case of the country’s first surviving 24-week newborn baby.